The Mate 20 and Mate 20 Pro come with very different screen technologies: the Mate 20 uses an RGBW LCD screen, while the Mate 20 Pro uses an OLED display. For the Mate 20, the panel is dual-sourced from Sharp and JDI, with the DDIC model "TD4336". The resolution here is 2244 x 1080, which is quite a bit stretched out for a screen of this size, especially because of the non-RGB subpixel layout. However for most people and normal viewing distances, this is not an issue, and only really arises when you hold the device closer to you. Viewing angles are excellent for an LCD, and I haven’t really observed any other immediately obvious drawbacks for this model. The Mate 20 Pro uses an OLED display, and this is the first time that Huawei has shipped a 1440p phone. The device’s screen comes in at a resolution of 3120 x 1440. Panel-wise, Huawei is dual-sourcing from both LG Display as well as BOE. The DDIC for the LG model is marked "EA9151" whose manufacturer I haven't yet figured out, but strongly leaning on this being LG silicon, while the BOE model is sporting a new generation Synaptics R66451 which we've covered at CES earlier this year. The review model I received is sporting an LG panel. Now I have to admit that I never much understood people who were put off by hue shift of some OLED screen when viewed by off-axis angles, that is until I actually unboxed the Mate 20 Pro for the first time. Unfortunately either Huawei or the panel manufacturer are using some sort of unusual type of polarization layer above the OLED panel, which causes this effect to be a lot more pronounced than any other OLED device I’ve come across. The polarization layer is a little talked about topic and I’ve never really see any teardown really address this, so here’s an older Tweet of mine showcasing the layer of a broken down S7+ display. The polarization layer is what makes displays able to actually appear as black/dark, as the OLED panel itself to the naked eye just appears as a sheet of bright copper. The iridescence of this polarization layer is also what actually causes hue shifts in OLED displays. Now I wouldn’t say this is an absolute deal breaker for the Mate 20 Pro, and it is something you can get used to, but the fact that I immediately noticed this even though I’ve been using OLED phones as daily drivers for the past 7 years should be something that users need to keep in mind. As always, we thank X-Rite and SpecraCal, as measurements are performed with an X-Rite i1Pro 2 spectrophotometer, with the exception of black levels which are measured with an i1Display Pro colorimeter. Data is collected and examined using SpectraCal's CalMAN software. Huawei allows users to choose between two screen colour modes “Natural”, which targets the sRGB colourspace, and “Vivid” which targets Display P3. Alongside these saturation choices, Huawei also presents three pre-defined colour temperature settings “Default”, “Warm”, and “Cold”, beyond these there’s also infinitely adjustable colour wheel for finer adjustments. For the measurements, I’ve chosen the most accurate presets as provided by Huawei, which is usually just the default colour temperature in either colourspace mode, with the exception of the “Vivid” mode on the Mate 20 Pro where I had to choose the “Warm” preset because the default was far too cold and blue in terms of whites. The same actually applies to the Mate 20’s Vivid mode, however this wasn’t easily fixable. 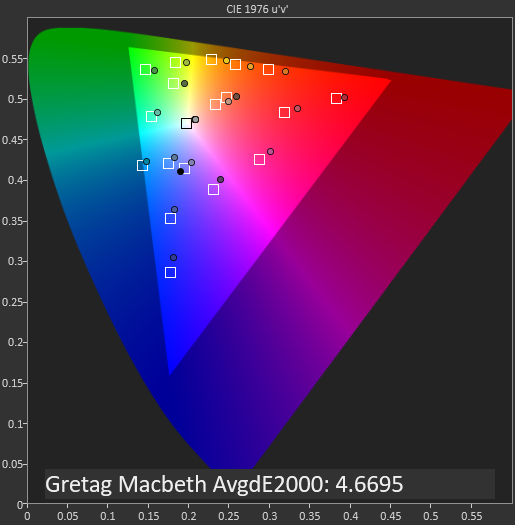 On the Mate 20 Pro, at 200 nits we see some really good greyscale accuracy in the Natural/sRGB default mode with overall accurate colour temperatures across most levels. At the lower levels the gamma is a bit lower, making darker colours appear brighter than they should be. Switching over to the Display P3 “Vivid” mode this behaviour in the gamma curve disappears, although the colour temperature here is just slightly warmer than the D65 target. Here there’s some need for fine-tuning with the colour wheel to be able to hit better results. Switching over to the Mate 20, we see some less-than-impressive results. Here the phone by default comes with a terribly reddish screen, and this is showcased by the very low 5900K colour temperature. In the sRGB / Natural mode this is not fixable even when selecting the “Cold” mode, and this actually introduces more error in the greens. The best result is again manually adjusting it with the colour wheel, but even at the most extreme setting it’s still not able to correct the vast red overshoot of this calibration. What is also very peculiar here is the gamma curve of the calibration, it’s only nearing the target 2.2 towards the middle levels, while being far too low both in darker and lighter levels. Switching to the “Vivid” mode on the Mate 20, which is the default that that phones come in, the peculiar gamma behaviour is gone, albeit while flat now, it’s slightly higher than the 2.2 target, making things appear more dark and contrasted. While the “Natural” mode suffered too much of a red shift, this mode veers off into much too blue. Again this calibration here isn’t easily fixable and one has to play with the colour wheel to get some reasonable results. In terms of brightness, the Mate 20 Pro reaches 417 or 441 nits depending on mode while on maximum manual brightness. The Mate 20 goes up to 460 / 492 nits. Both phones have brightness boost modes while in auto-brightness mode and also while in very lit environments, here the Mate 20 Pro goes up to 562 / 586 nits, and the Mate 20 goes up to 723 / 702 nits. In this mode they also apply an artificial lower gamma curve for better sunlight legibility, but for some reason this doesn’t happen on the Mate 20’s “Vivid” mode. 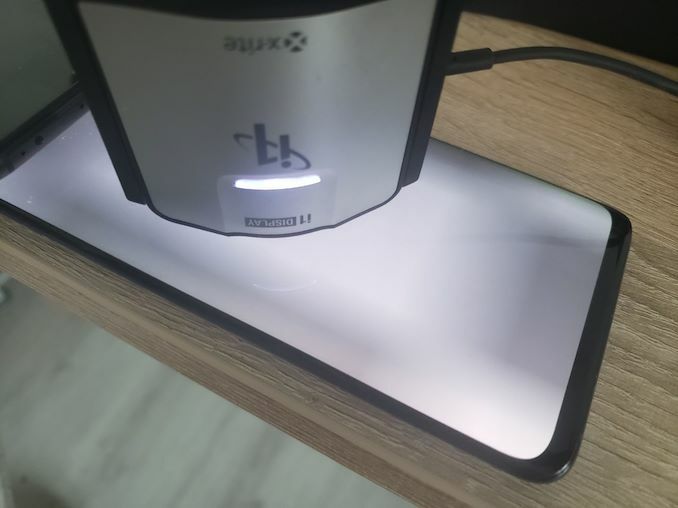 Something that was immensely annoying on the Mate 20 Pro – and also a bane in terms of calibrating the display for 200 nits for the battery tests – was that it uses a quite aggressive CABC (content adaptive brightness control) mechanism. Here the screen’s brightness will vary depending not only through the APL (average picture level), but also on percentages window sizes. Where this was most visible is the resulting gamma. The above measurements were done with at 25% central measurement area, with the outside area adjusting to try to target the given APL level. First of all the central area’s and APL always influences brightness, so I always recalibrate the centre’s brightness back to 200 nits. The resulting gamma curve while in this mode is definitely wonky, but again this isn’t because the gamma curve is wrong, but because the screen continuously readjusts its brightness. We’ve had LG phones in the past showcase the same behaviour, and unfortunately there’s just no way of turning this off. Another absolutely astonishing behaviour that I encountered while doing the auto-brightness greyscale measurements on the Mate 20 Pro is the fact that the display showcases large brightness artifacts in this mode. The above video showcases a 3.9% grey (#0A0A0A) and I’m triggering the boost mode with an LED flash. What looks to be happening is that whole areas of the screen just aren’t boosting to their target brightness. The resulting pattern is also not constant and will vary with each switch, but is always located on the sides of the panel. This apparent non-uniformity visibly goes away at higher levels, but what was enlightening about this is that the pattern is never really gone, it just becomes unperceivable to the eye. Measuring it always reveals a slight deviation in brightness of a few nits in the general form of this pattern. While this was an edge-case issue for the Mate 20 Pro, it’s just massively disappointing for the LG panel and the fact that it went past QA. Moving on to the actual colourspace calibration measurements, we see the Mate 20 Pro doing an “ok” result with a deltaE200 of 2.4. The actual issue here is oddly enough that the screen is under-saturated in all primary colours, undershooting the sRGB target. The Mate 20’s issue isn’t per se that is under-saturates, it’s just that the whole calibration is shifted too much towards the red spectrum, something I’ve addressed in the greyscale results. 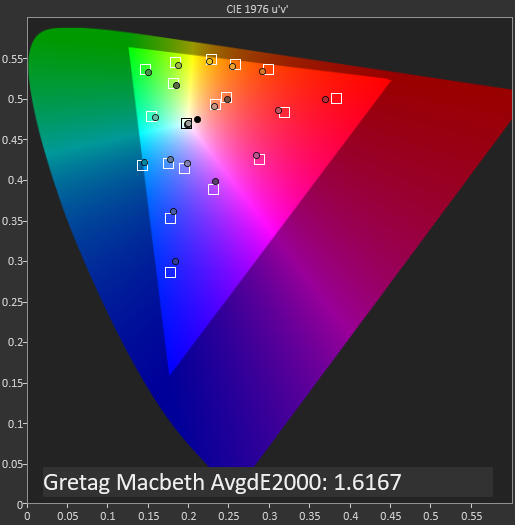 This can be mostly remediated by using a custom colour temperature target to the very edge of the colour adjustment wheel between blue and green, with a bias more towards blue. Still, it’s not enough to fix the large calibration issues. Switching over to the “Vivid” Display P3 screen mode, the issue with the Mate 20 Pro is that the blue spectrum is overshooting its targets. Intermediate levels in green are oversaturated as well, while the reds present a non-linear behaviour, undersaturating the lower levels while oversaturating the higher levels. The Mate 20’s calibration in the “Vivid” mode is better than the Natural mode, however there’s still issues with shifts. The red and blue channels are accurate in their hue, but green is too off, which means this can’t be corrected by the colour wheel, as this affects all colours of the colour space. In the GretagMacBeth test of commonly found tones and skin colours, the Mate 20 Pro fares very well in its Natural default mode, however the Mate 20 is just wildly off with the colours, beyond the threshold of what is perceivable with the naked eye. I’m actually writing this part after having tested the battery results of the two Mate 20’s – with a bit on hindsight on my part, the topic of screen power efficiency is quite important, especially since the Mate 20 and Mate 20 Pro have two very fundamentally different screen technologies. Here I’m showcasing the total device power in idle conditions (airplane mode) at varying display brightness levels. This not only show the luminance efficiency of the panels (the delta between 0 and a certain brightness point), but also the absolute minimum idle power of a phone. I’ve also thrown in a few other relevant phones into the graph so facilitate the following analysis and discussion. Off the bat, the Mate 20 and Mate 20 Pro showcase very different resulting power curves. There’s two things to consider here: the luminance efficiency, which is represented by the slope of the curves, as well as the base power consumption. As I had already noted in our review of the LG G7, the luminance efficiency of RGBW panels can be quite excellent and easily surpasses that of OLED phones while displaying fullscreen white. It’s this exact behaviour that we see here between the Mate 20, and most other OLED phones. To keep things in mind, we have to remember that in everyday use-cases with common media, the actual APL will vary a lot, and this advantage of OLED phones isn’t nearly as great. The more concerning aspect is the base power consumption. The Mate 20 Pro showcases a very stark difference to the Mate 20. At 0 nits, meaning when the displays are showing a black image, the Mate 20 Pro consumes 519mW versus the Mate 20’s 348mW. When switching over to a full white image at minimum brightness of ~1.5nits, the Mate 20 Pro jumps almost 84mW, a delta that is uncharacteristically higher than any other OLED phone. Here the Mate 20 Pro comes in at 603mW versus the Mate 20’s 393mW. This 210mW difference is quite alarming, as it is part of the phone’s base power consumption that is essentially ever present no matter what you do while the screen is on. This is also one of the core issues that hampered the LG G7 from achieving better battery life results, even though its luminance efficiency was excellent. I haven’t reviewed the LG V40 as of yet as I’ve only received a unit, but I wanted to get its results into this graph to see if we can see any correlation between the LG screens. In terms of luminance efficiency, the Mate 20 Pro’s screen is slightly worse than the V40’s. Where the V40 absolutely blows it, is in the base power consumption with a staggering 786mW while displaying black. I haven’t run the battery tests on the V40 as of yet but I can already tell it’ll end up with disastrous results, something that seems to match the experience of other reviews. 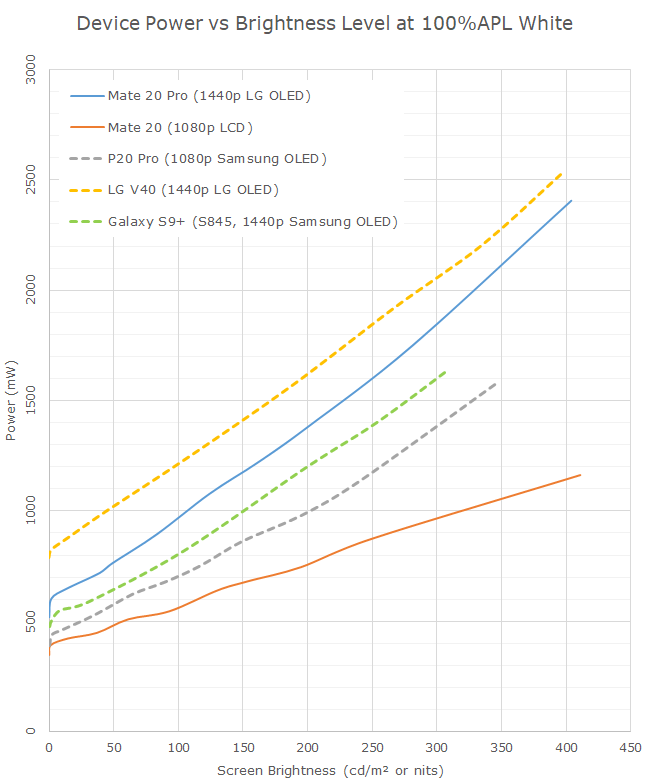 What is alarming for the Mate 20 Pro is that this is quite a regression over the P20 Pro, as well as the Mate 10 Pro (not graphed). These previous generations were using Samsung supplied panels, with a lower resolution of 1080p. Again I included the Galaxy S9+ in the results as well to demonstrate that 1440p isn’t the inherent issue here, as this unit also fares quite better than the Mate 20 Pro. In the last hours of this review, HiSilicon was able to get back to me and confirm that the Mate 20 Pro uses dual MIPI lanes in order to achieve the bandwidth for 1440p - something which is quite unfortunate. Samsung achieves 1440p on its phones by using a single MIPI lane with compression (either DSC or a proprietary format with Exynos), which is a much more efficient way to drive the DDIC. Moving on to the battery life results, it should be interesting to see the effect these display power discoveries.